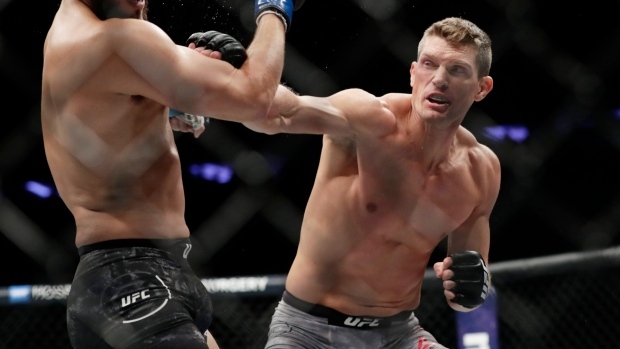 UFC welterweight Stephen Thompson is known as a fighter who can end a bout with one perfectly placed kick, yet his last five fights have gone the distance. That stretch of fights has seen him earn victories over Rory MacDonald and Jorge Masvidal, while battling to a draw and a loss against then welterweight champion Tyron Woodley and most recently losing to Darren Till. Now, heading into his Fight Night Nashville headliner against Anthony Pettis, the 36-year-old is focused on fighting his fight and not leaving the decision in the hands of the judges. Petti is known for perhaps the most famous kick in MMA history, the “Showtime” kick that he landed on Benson Henderson in 2010. The chance to match skills has Thompson fired up for his bout against the former UFC champion. “That’s one of the reasons why I was so excited for this fight, because I am a fan of Anthony Pettis,” said Thompson. “We both have similar styles. Of course, he comes from a taekwondo background; I come from a karate background, so it’s pretty much who is going to be the better ninja on Saturday. Woodley retained the welterweight title in back-to-back fights against Thompson at UFC 205 and UFC 209, but has since dropped the belt in a one-sided loss to Kamaru Usman. Thompson believes Woodley’s defeat was a case of one fighter wanting it more and being in the right frame of mind. Masvidal may have moved into the pole position for the next welterweight title fight after his recent KO victory over Till in London. While Thompson lost to Till, he does hold a recent victory over Masvidal, but isn’t sweating it if the next crack at the title doesn’t come his way. So if the title shot goes to Masvidal, Thompson could be a couple fights away from his chance, but he plans to stay ready and keep racking up the victories he needs to get back into the championship picture. Well before the end of the year, June in fact, the UFC will be heading to Greenville, S.C., for an event. Thompson, a South Carolina native, is very interested in being on that card, provided he comes out of Saturday’s fight unscathed.